I was born in Munich, Germany, but turned out to be pretty cosmopolitan. I am equally at home in New York, London, Manchester, Havana and Hamburg, places where I lived, worked and/or studied. For the last 10 years Barcelona has been my home. I love trekking! Once a year, I pack my backpack, disappear for a month and enjoy beautiful landscapes, the luxury of being outside all day and the comfort that lies in knowing that my 10kg back pack (2 of them are water) contains everything essential. Though, I admit that one of the essentials is my credit card. What makes that a fun fact? I am overweight, untrained and because of a knee injury very, very slow. So, in the first days, I always look like dying. How do I know? When people walk by, and 50% of them ask you whether you are alright and the other 50% lift their thumbs and say: “You are doing great here! Keep on, you are going to make it.” You know you look like you are NOT going to make it. After years in big agencies with big campaigns for big brands, today, I work in my own little ad agency, called FRAU FRICKE. – and more as a hobby I teach advertising and branding at Instituto Europeo de Design, Barcelona and Westminster University, London. I think I am doing my dream job. My dream job is detecting what is special in something and make it visible and desirable for everybody else. O yes, and I would love to finish the novel I am currently writing. First of all because I love my job and I love learning. That, by the way, is what attracts me most in my job: there is always something new to learn. 2. While everybody thinks that Digital Marketing is the future, I think, it arrived in presence already. Traditional agencies just try to ignore that and newbies don’t have the experience to handle the situation. Strangely, old school advertising and digital advertisers hardly ever work together. And so, I see a bright future for those who can. Never before was it so easy to advertise, and so difficult for clients to find the right way. What has been the most interesting thing you’ve learned through the specialization/course you are on? Though, I love the courses and I learned a lot, my favourite learning came from a co-student – Muhammad Kamran Zafar. Grading my assignment, he took the time to write a pretty long, very friendly detailed report on what he liked about my answers, how it helped him coming to new insight and what talents of mine he thought showed by that. I was enormously inspired. Like most of the other students, I only wrote a longer comment if I had to give a bad grade because I wanted to make the student understand what he needed to relearn. Like everybody else, I gave the better students only a “well done” or “excellent job” and forgot that they need inspiration as well. From then on, if not awfully under pressure, I took the time to write longer comments under the better assignments as well. It makes me feel better and I hope, it makes the person on whom I commented feel better as well. I did before and I keep doing it – but I am way better informed now. Congratulations that you came under the spotlight on this course. I would like to thank you for mentioning me in your Q&A, I consider it a privilege from one of my intellect fellow student in this specialization series. I was not only inspired by your writing but also influenced in my way of thinking and generating ideas in the marketing and communication context. Even before knowing about the wealth of professional experience that you have earned so far, I recognized you as an excellent narrator of solutions to the business problems. I look forward to read more of your work. 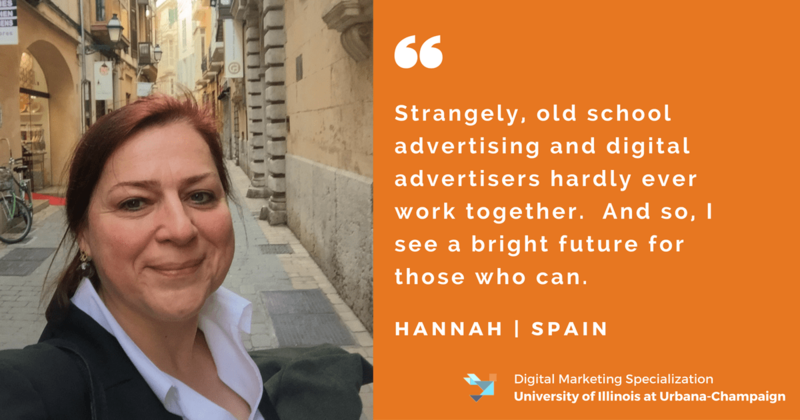 At the end I appreciate the efforts of Illinois Digital Marketing Specialization team for creating an awareness about fellow learners through this segment. 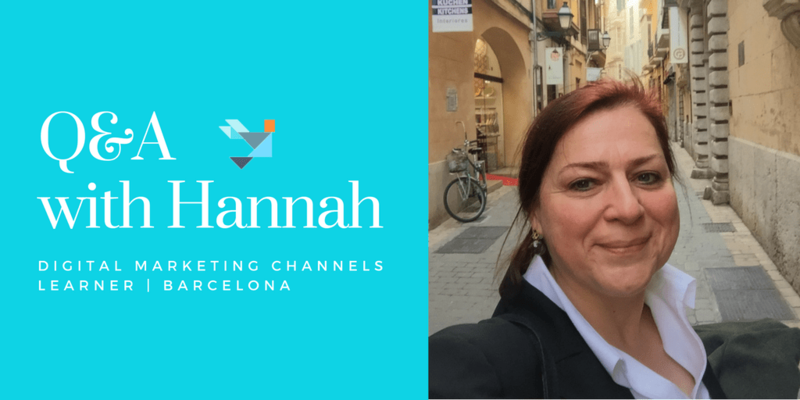 Hi Hannah, loved reading your candid answers! Reinforced that this specialisation was a good choice and one can never stop learning. Ahhhh am guilty of those 2 word reviews. I will try to improve on that going forward. Good to read about your perspectives on digital advertising and marketing ‘the future is already here’. I think you are right, and wish you lots of good business at Frau Fricke! Inspiring about Kamran’s contribution. Absolutely important to take the time to give meaningful feedback to our peers, as we appreciate it ourselves. Pleasure reading about you!